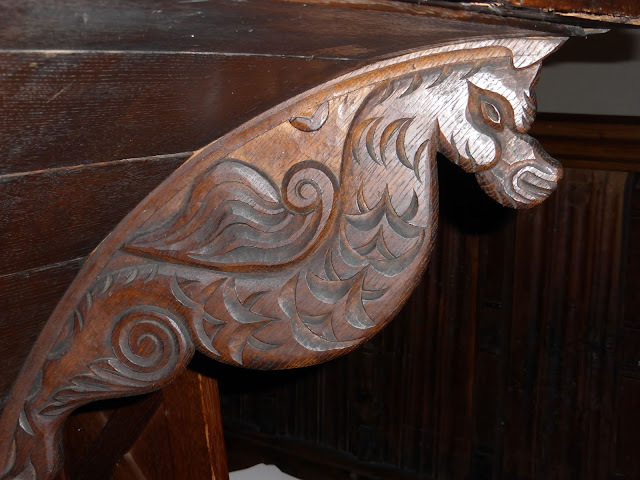 This is part two, concerning St Michael's furnishings etc. You can read part one, about the architecture, here. Apologies for the currently unsatisfactory quality of many of these photos. The next time there's a sunny day and I'm free I shall go and try to take better ones. 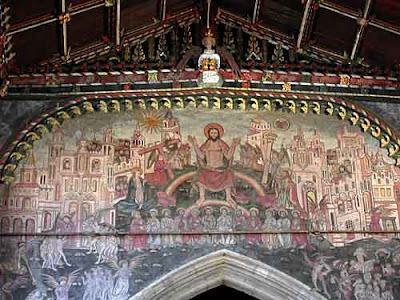 They usually follow the same format (though the one at Chaldon is different): Christ is in the middle at the top, often sitting on a rainbow, with Heaven on his right (i.e. on the viewer's left), and Hell on his left. 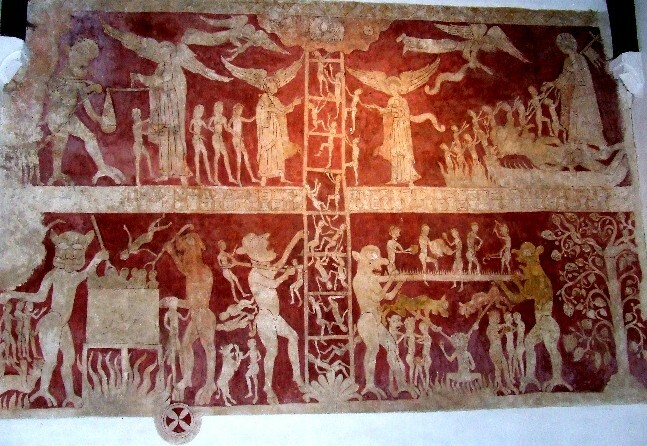 The saved are seen being welcomed into the former, while the damned are eternally tormented by devils in the latter. 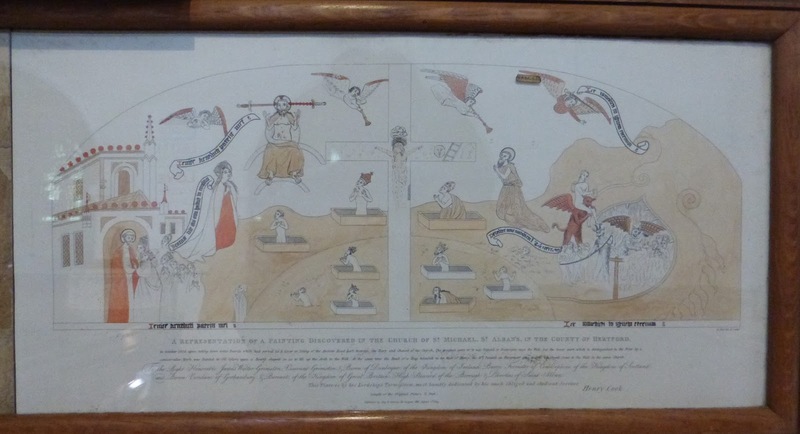 The Dooms were textbooks in a largely illiterate age, designed to teach the congregation about the bliss they would find should they get to Heaven, but also, and even more importantly, to thoroughly terrify them with the horrors of Hell, and thus ensure that they followed the Church's teachings. 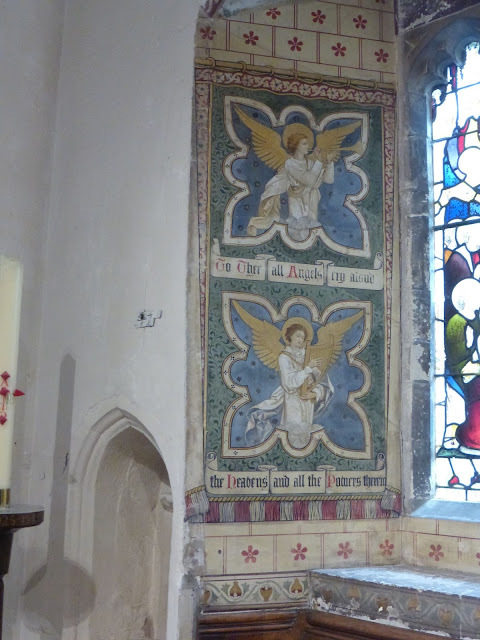 Displayed on the south wall of St Michael's is one of only two Herts remnants of Dooms (the other is a fragmentary wall painting in Flamstead). Its rarity is increased by being on wood (though I don't think it counts as one of the five survivors as it's only a small section of the complete painting). Oddly, however, Pevsner ignores it. 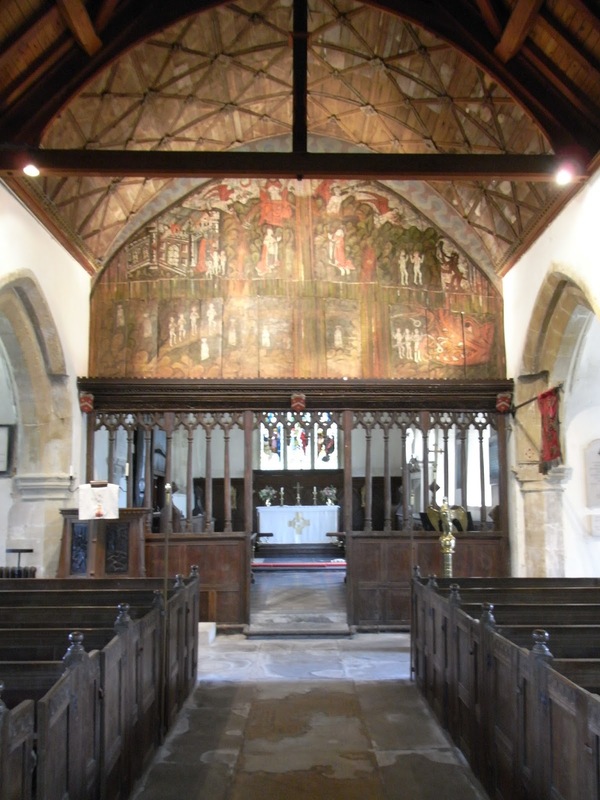 In 1808 the remains of St Michael's Doom, probably dating from the 15th century, were discovered over the chancel arch. 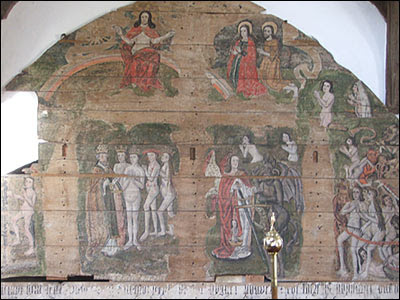 The custodians of the church at the time lacked the means or the will to preserve it, but at least it was documented before it was painted over, and a reproduction of the original copy of the Doom now hangs beneath the surviving section. On the left is seen Heaven, imagined as a handsome building with St Peter standing in the doorway. 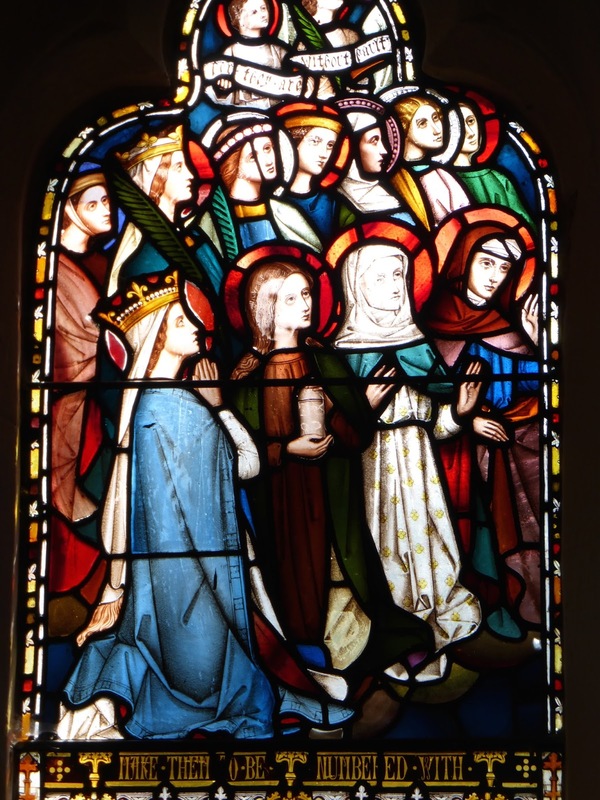 To the right of this is Mary, and above her and to her right is Christ, seated on a rainbow, overseeing proceedings. 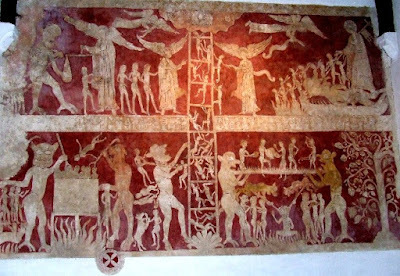 The middle is a crucifixion, with angels sounding the Last Trump above, and below souls rising from the dead. (The semi-circular section at the bottom is the only surviving detail.) On the right is Hell, imagined as a monster with gaping mouth, swallowing sinners being chivvied in by bat-winged devils. One devil is giving a piggyback to a not especially alarmed woman carrying a tankard, her sin presumably being drunkenness and/or gluttony. The banner (the equivalent of a comic strip's speech bubble) at the devil's heel says 'Go, souls, into eternal fire', and sure enough in Hell's mouth the damned are burning. But nearly all this has gone. What survives is a wooden tympanum which would originally have fitted under the chancel arch, with the lower third of the cross, and six dead awaking and looking toward Heaven. 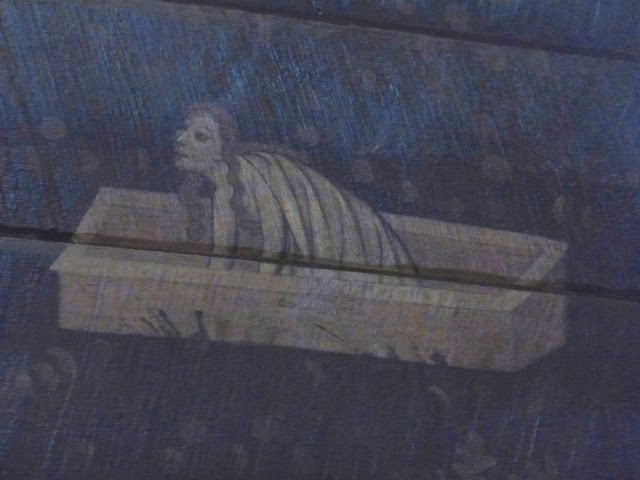 Note the unperspictival depiction of the coffins; perspective was invented in Italy in the early 15th century, but took well over a century to reach England. The first figure (top left) seems to be a bearded Pope, wearing his papal tiara. 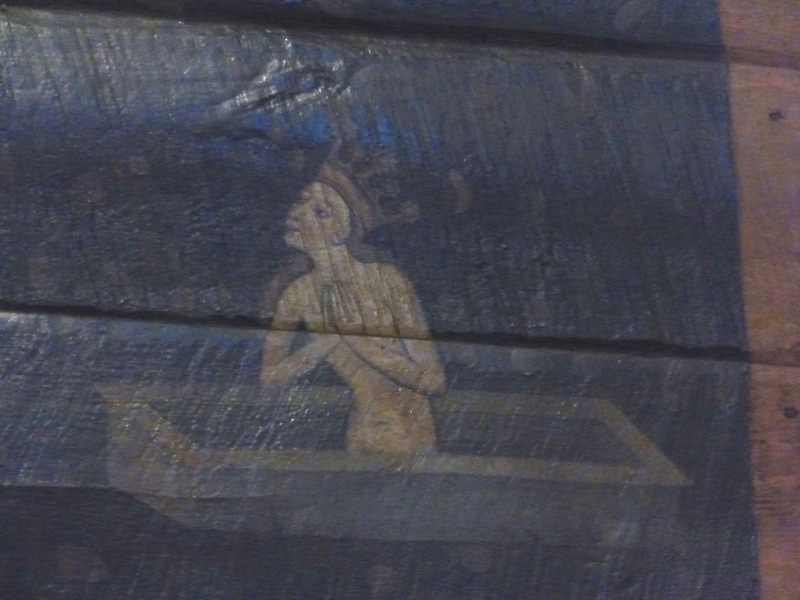 (Incidentally, the dead have mostly lost their robes but retain their headgear as an indication of their status). His hands are not clasped, but extended, palms inwards; I assume that there's a meaning to this gesture but I don't know what it is. Perhaps someone could enlighten me. 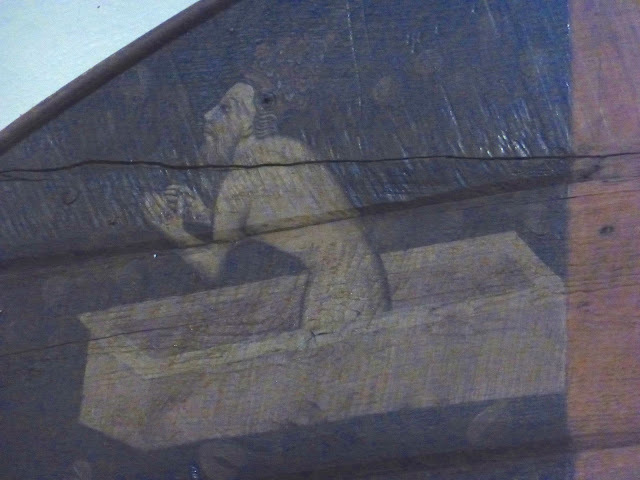 The second is a king, also bearded, wearing a crown and what appear to be boxer shorts. Being royal he is spared the indignity of appearing completely naked. He is crossing his hands over his chest; again, I'm sure this gesture must have a significance. 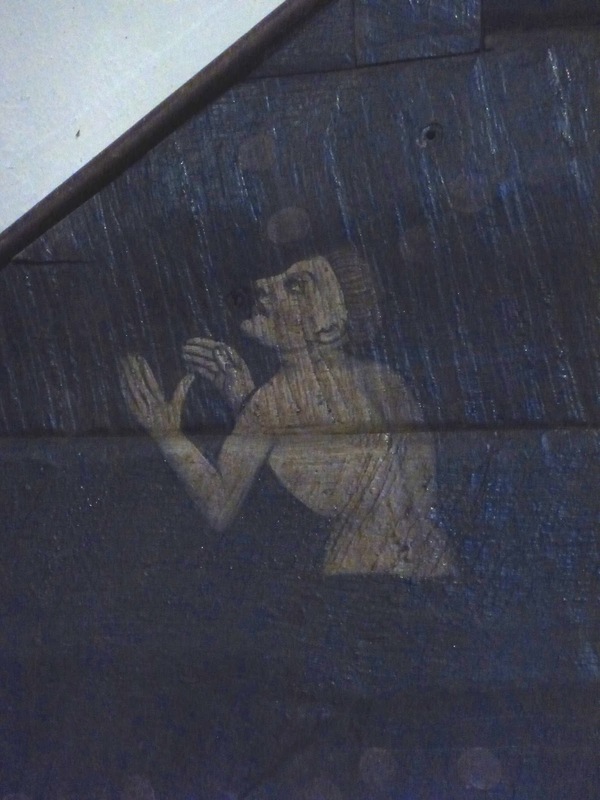 The third (on the bottom left) is a man with a pudding-bowl haircut, familiar from portraits of Henry V (died 1422), so the style would have been fashionable when the Doom was painted. 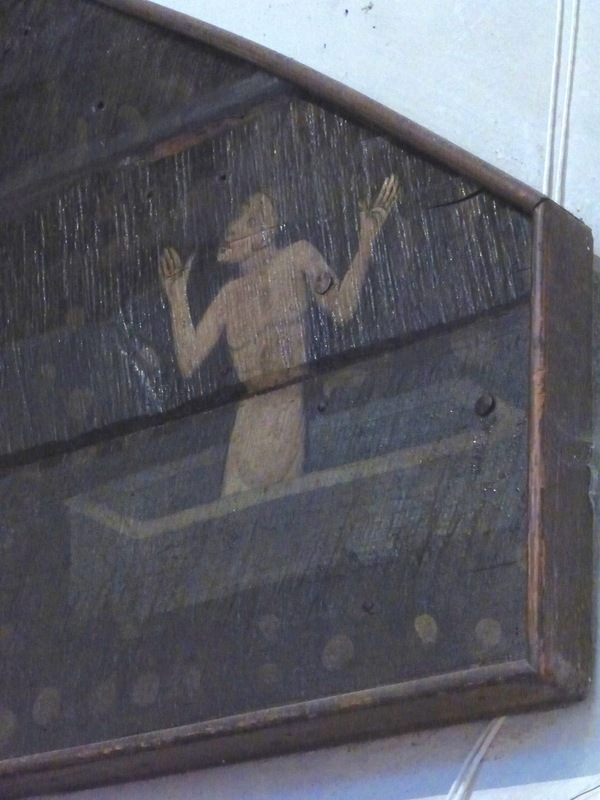 He has an especially awed expression; his gesture is similar to the pope's. The fourth is a queen with flowing hair, crown and slender waist. She looks serenely joyful and clasps her hands together and to her chest in fervent prayer. The fifth is a woman with hair even longer than the queen's. 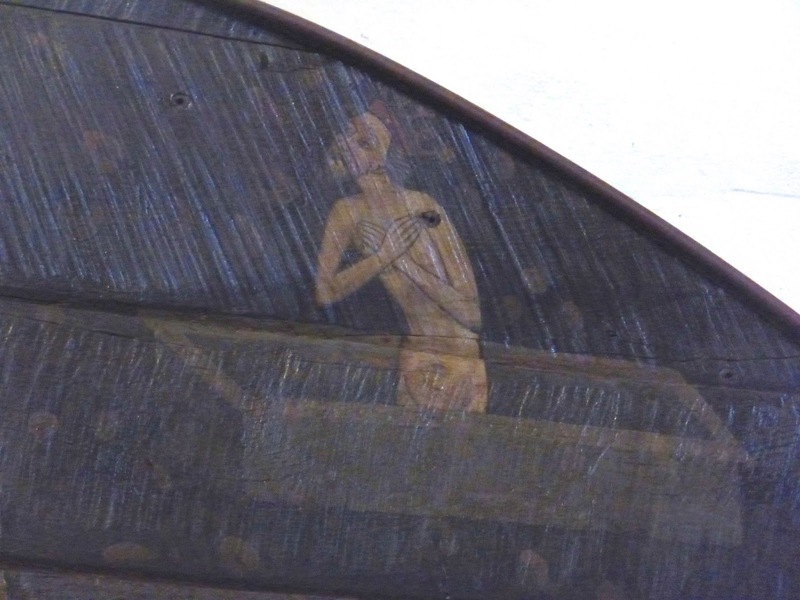 She is still wearing her shroud, and appears awed. She is the only one of the six not gesturing, as she's using her arms to get up. The last of the awakening dead is perhaps the most humanly affecting of them all: he looks surprised, even shocked, arms spread wide and mouth agape, to be witnessing the Last Things and to find himself on his way to Heaven. 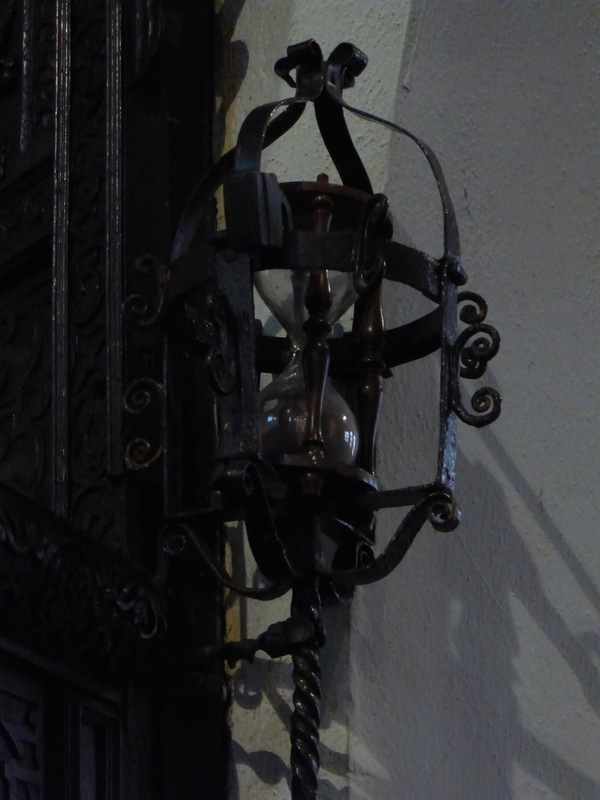 On the evidence of this tympanum, fifty percent of those who escaped Hell were either royalty or from the upper echelons of the Church: not very encouraging odds if you were one of the multitude. The late medieval artist (though he wouldn't have thought of himself as an 'artist', merely as an artisan) who painted the Doom wasn't especially skilful or sophisticated, but he has brought some individuality and humanity to the six surviving resurrecting figures. Believe me, I've tried, but I really can't avoid saying that he's brought them to life. 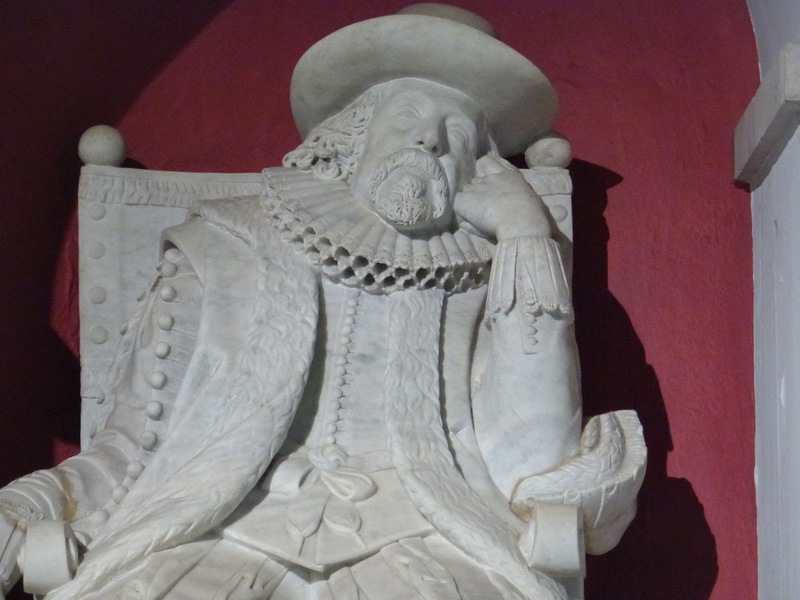 Francis Bacon (1561-1626), 1st Viscount St Alban* and Lord Chancellor, an important figure in the history of science and of some significance in the colonisation of the New World, and in other aspects of life in early 17th century England, lived at Old Gorhambury House**. 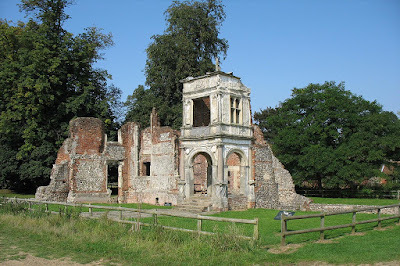 The ruins of his home are well worth the mile and a half stroll from the church along a footpath past the theatre. He famously died (at least according to the gossipy John Aubrey) of pneumonia caught by stuffing a chicken with snow in order to study the effects of freezing on meat. 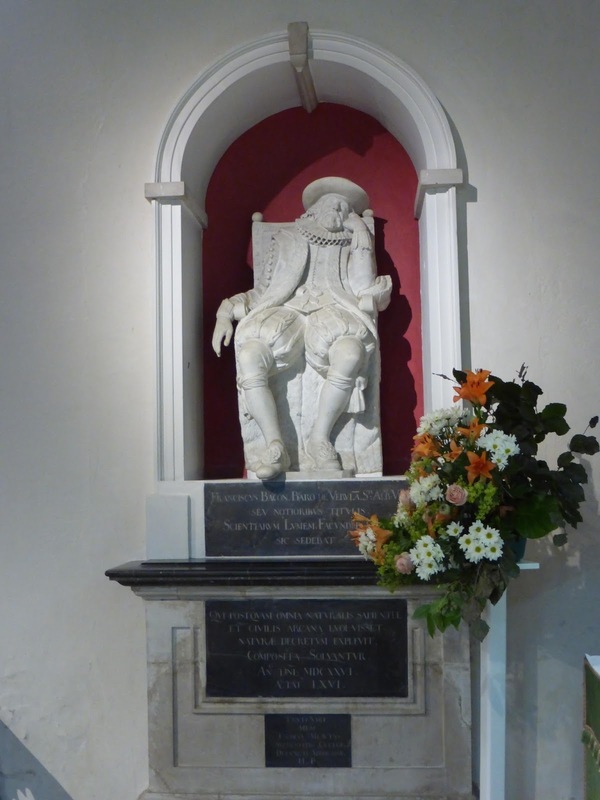 His life-size monument stands on the north side of the chancel. 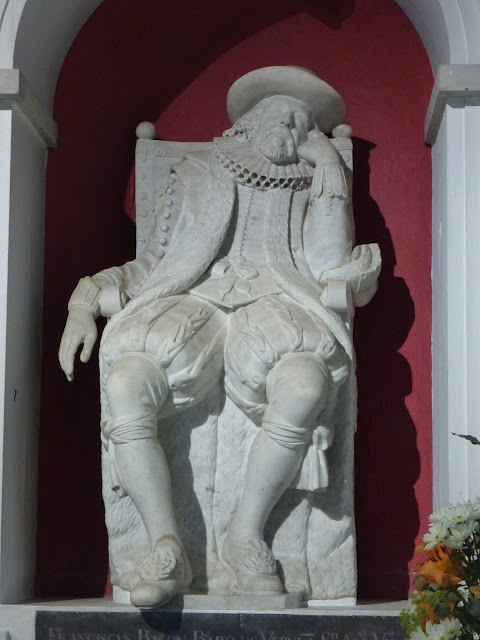 He is shown seated, an unusual posture for figures in monuments (they're usually either standing, kneeling in prayer or recumbent), and, even more unusually, and delightfully, he's having forty winks. This is very endearing, as if he were sitting for a portrait and just couldn't keep his eyes open. His right hand droops languidly and his legs are casually splayed. 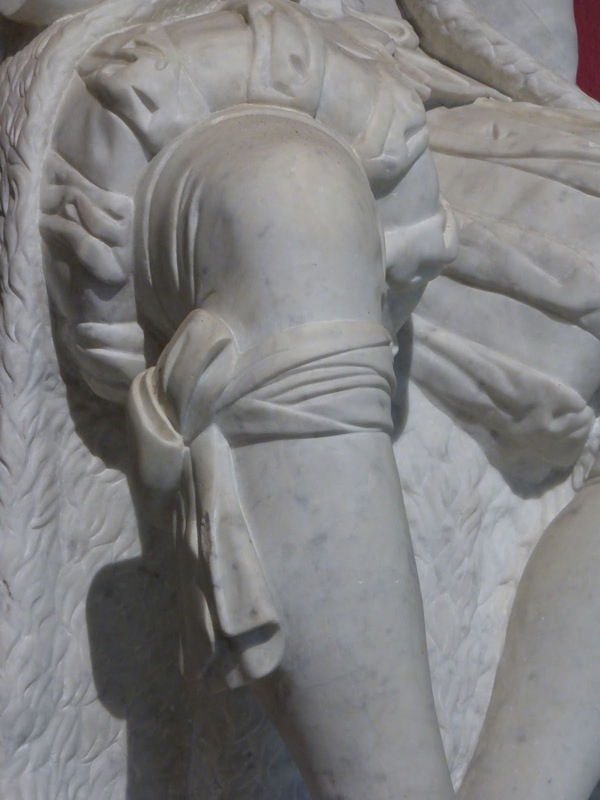 He's dressed in his best, including those absurd tied-up-above-the-knee breeches that look as if they've been inflated, and, below the knee, extravagant bows. A perky wide-brimmed hat tops off the sartorial composition. There's a copy of this statue (by Henry Weekes, 1845) in the chapel of Trinity College, Cambridge, which, however, omits the hat. I was brought up to believe that, except in certain well-defined circumstances, hats were not worn indoors by gentlemen. (Not that my respectably lower-middle class upbringing gave me any cause to consider myself someone of such standing. I still pause at the doors of lavatories marked GENTLEMEN and worry that I'm getting above my station.) No doubt etiquette was different in Jacobean times. Perhaps the sculptor of the copy also thought that the indoor hat (especially in a house of God) was a social solecism and left it out to spare Bacon's blushes; you could say, to save his bacon. I'm sorry, I don't know what's come over me today. It wasn't common for monuments to be signed at this date, and no documentary evidence about the origins of the monument apparently survives. Although it's well carved, it's not up to the standards of the best sculptor of the day, Maximilian Colt (who carved the superb Cecil monument at Hatfield). 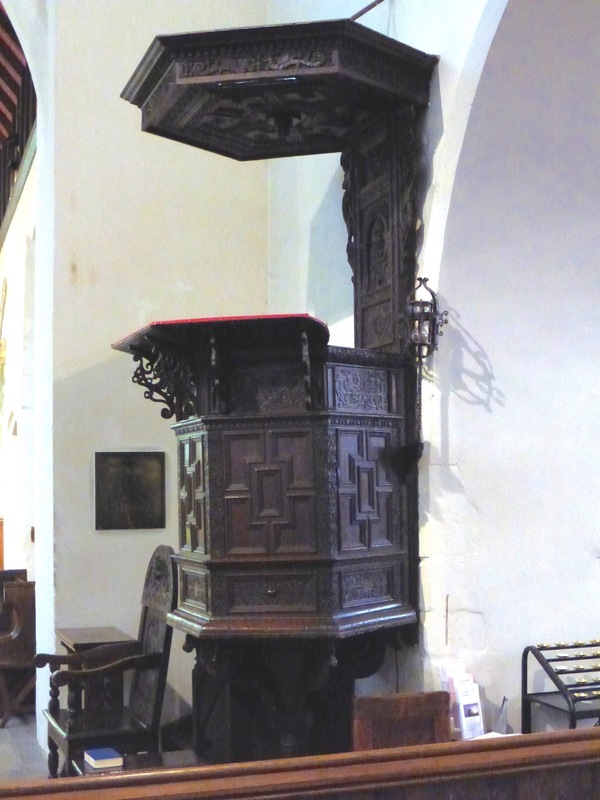 There are lots of Jacobean pulpits (i.e. from the reign of James I (1603-25), Jacobus being the Latin equivalent of James), because James issued an edict requiring all churches to have one. (Similar rules had been made before, but presumably not rigidly enforced.) 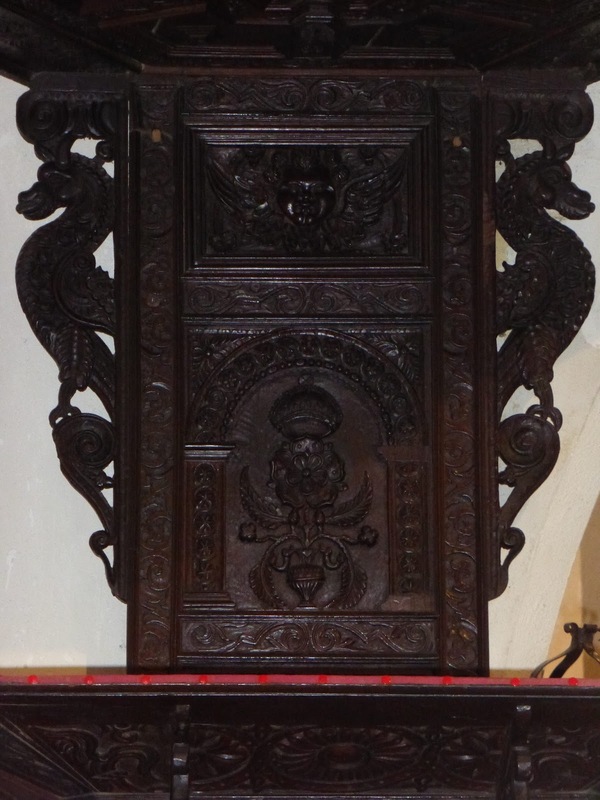 St Michael's example is particularly splendid; it's supported on dragons, and is complete with stairs, book rest, wrought iron hour glass (for timing the sermons), standard (the back board) and tester (the sounding board at the top). The standard has flanking gryphons. 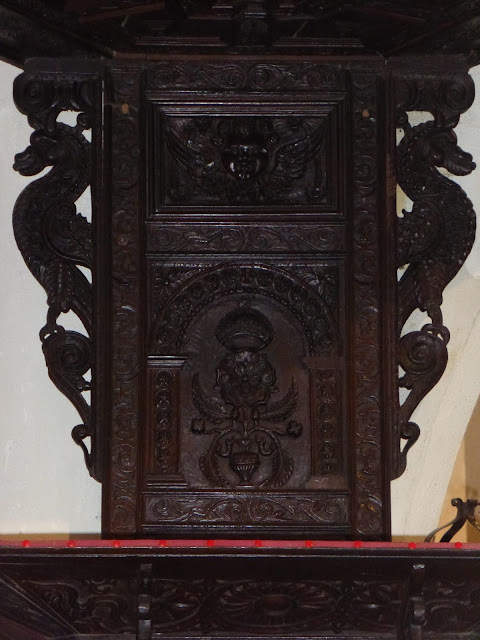 There are also an altar table and a pair of chairs, all of similar date to the pulpit. 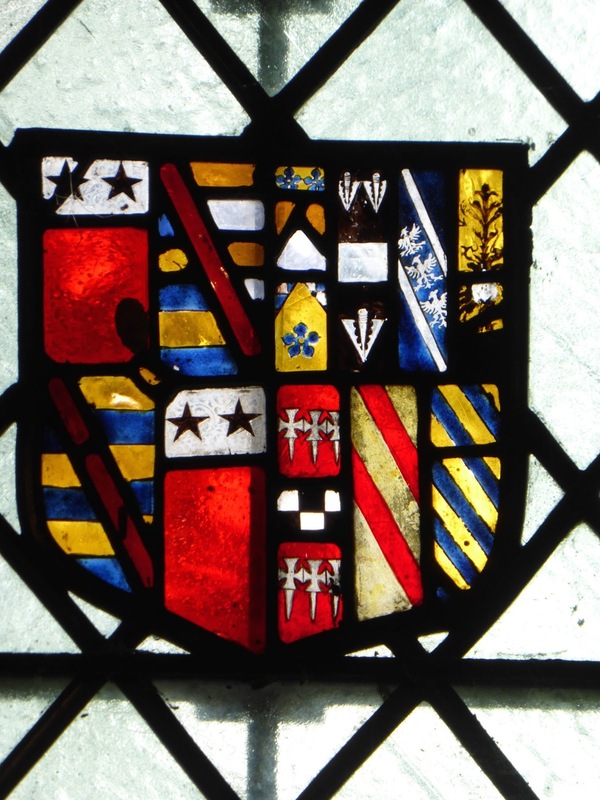 There's no medieval glass in the church; this small but richly coloured heraldic shield in the chancel is the only ancient glass. 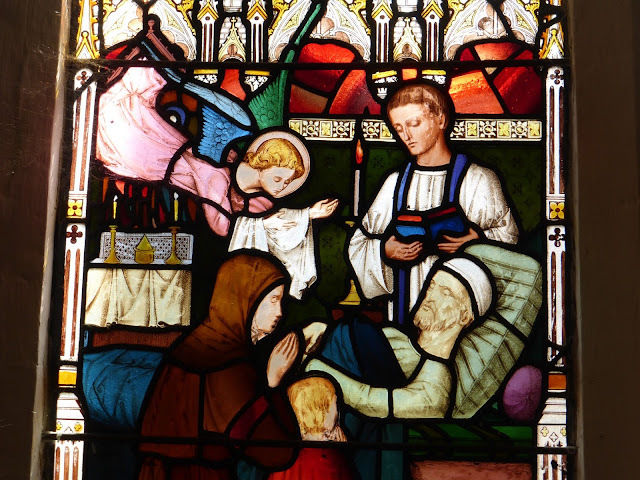 There is however plenty of Victorian glass, most of it of at least acceptable quality. 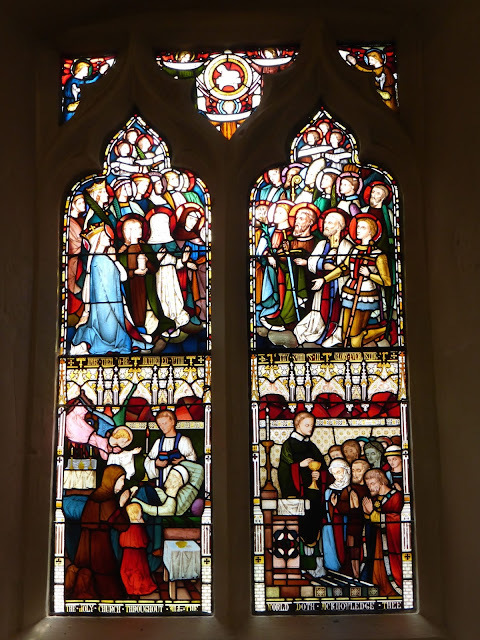 I'll draw your attention to just one of them, in the westernmost south window of the chancel. It was designed by Nathaniel Westlake (1833-1921) for the firm Lavers and Barraud, in 1861. 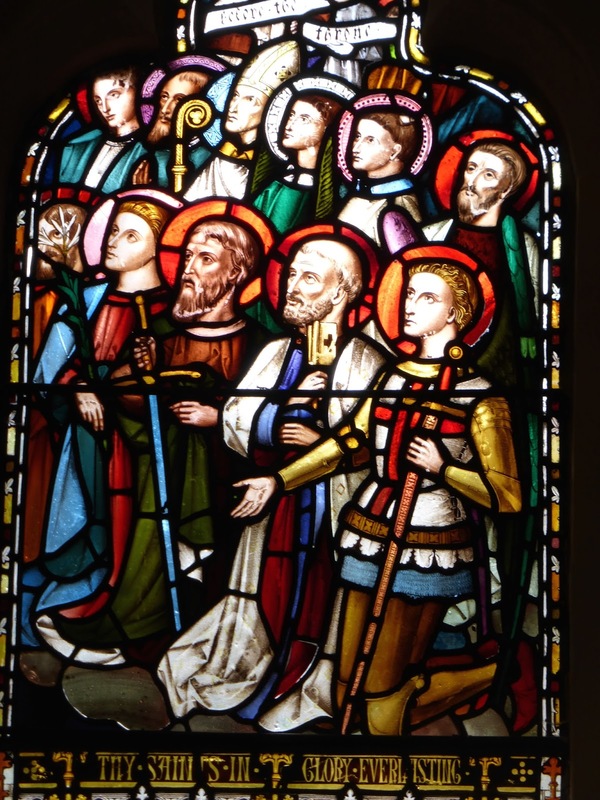 I think it's excellent; I like the way all the figures in the top are crammed together, frieze-like, with practically no background, making a very strong pattern, and the uninhibited colours. And, unlike much Victorian glass, the faces aren't too painterly and sentimental. The window depicts, in the top, the Communion of Saints adoring the Agnus Dei, and, bottom left, Extreme Unction (the last rites), and, bottom right, the sacrament of Communion. There must have been plenty of parishioners in 1861 who shuddered at the Popish implications of all this. The jambs of the easternmost south chancel window have Victorian painted decoration; a bit twee, but pretty enough. 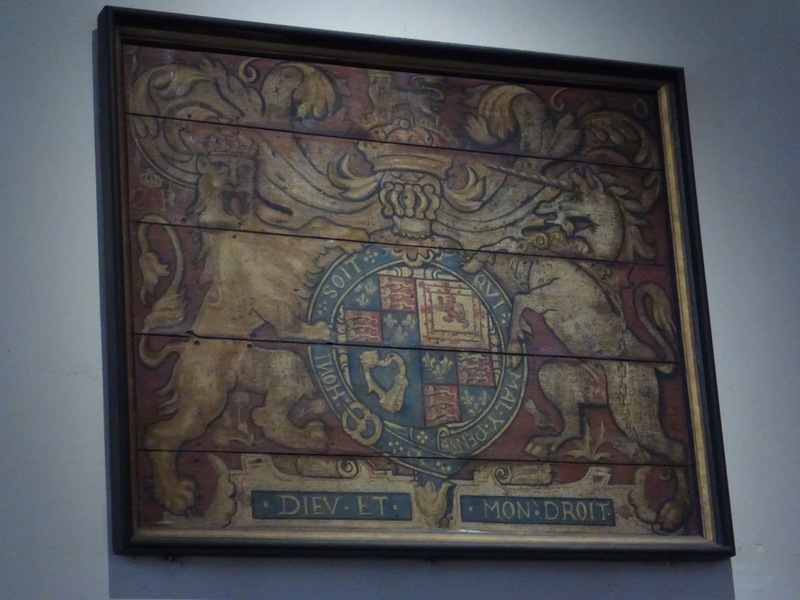 This crudely painted and worn royal coat of arms dates from 1660, the year of Charles II's restoration to the throne after the Commonwealth. 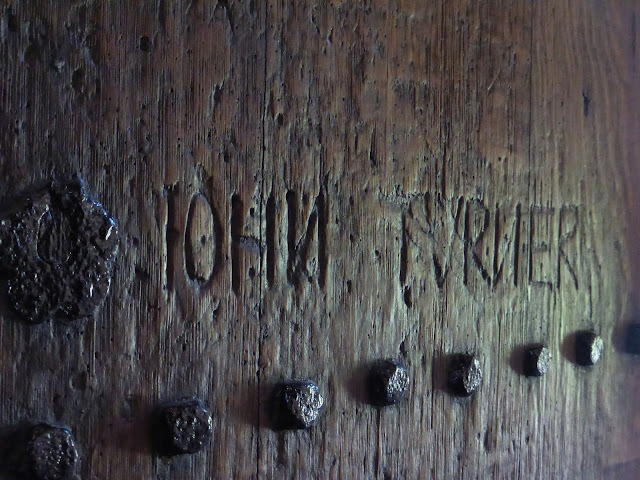 The south door is original, and has some confidently carved names; they don't look like illicit graffiti, and are perhaps the names of churchwardens. This one records the name John Turner, with an 'I' standing in for a 'J' and a 'V' for a 'U', as was usual before the 17th century, which gives us some hint as to the date of the carving. The backward 'Ns', however, imply limited literacy. 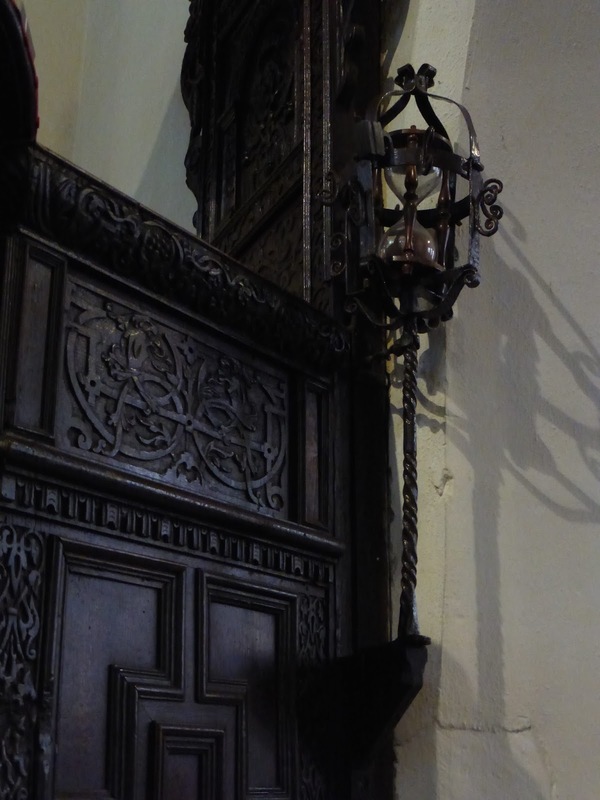 There's more to see in St Michael's than I've mentioned here; in particular, there are three brasses (but, as any regular readers these indigations might have will know, brasses have usually got to be pretty special specimens to interest me). I've usually been lucky when visiting the church and have found it open and welcoming. It's more likely to be open in the summer months than the winter, but even if you are unlucky enough to turn up when it's closed you can console yourself by visiting all the nearby Roman relics. But the church is certainly worth a second (or further) attempt to get in. * Confusingly, his title is sometimes spelt 'Alban' and sometimes 'Albans'. 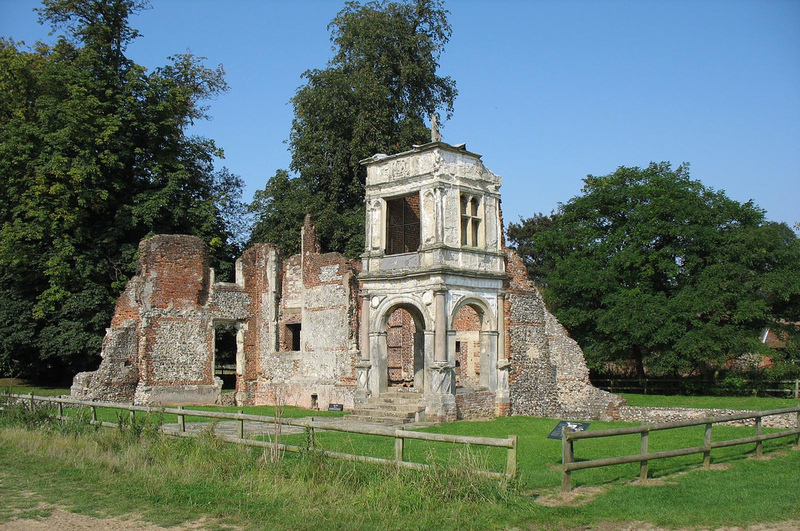 ** Its Palladian successor, Gorhambury House, is open to the public on Thursday afternoons from May to September (for details see here), and I thoroughly recommend a visit even though you have to join a guided tour and aren't allowed to explore at your own pace. The books in the library are still shelved and organised under classifications devised by Bacon.